By June 2, 2015, the second round of conflict minerals disclosures will be filed with the Securities and Exchange Commission (SEC). These filings fulfill a Dodd-Frank Act requirement for one of the first social disclosures related to human rights ever mandated. Despite industry arguments that the supply chain due diligence requirements are impossible and unachievable, many of the 1,315 disclosures filed last year prove the opposite to be true. These disclosures represent a rich data set that provides a baseline from which to compare future disclosures. 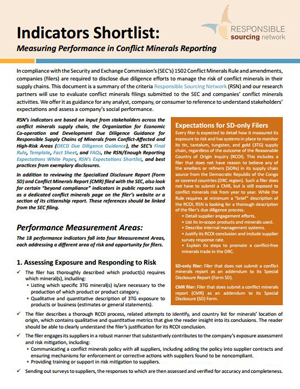 To standardize the evaluation of filings related to a company’s social performance on conflict minerals, Responsible Sourcing Network (RSN) has developed the Indicators Shortlist: Measuring Performance in Conflict Minerals Reporting. The Indicators Shortlist compliments RSN’s 2014 Expectations Shortlist for Company Conflict Minerals Reporting and Activities. This indicator set allows investors to track and compare companies’ conflict minerals activities with a clear and easily replicable methodology. The information summarized in our Indicators Shortlist will be followed by a comprehensive analysis of conflict minerals reporting, coming later this month. This report, Mining the Disclosures, evaluates the conflict mineral filings of 51 of the largest companies from 17 “high exposure” industries. With data gathered by research partner, Sustainalytics, RSN conveys trends per industry group, industry and company rankings, best practices, and associated action items for investors. With this indicator shortlist and the upcoming report, RSN continues to provide tools to companies, investors, and consumers to operationalize the intention of Dodd-Frank Section 1502. We aim to help bring an end to the conflict in Eastern DRC by supporting a demand for conflict-free minerals and encouraging an integrated supply chain due diligence.